1933 - Mayor Ernst Reuter is forced to resign and placed under protective custody. 1938 - The construction of the ship lift in Rothensee is completed. The synagogue in Grosse Schulstrasse and many shops of Jewish citizens fall victim to cruel fascist pogroms. 113 people are arrested and taken away to the concentration camp Buchenwald. January. A deadly bomb attack wipes out the old city centre and reduces 90 percent of the buildings to rubble. 60 percent of the city is destroyed. The factories of the Krupp-Gruson-Werk, the Junkerswerk and the Brabag are affected to a great extent. In the outer city districts collection points are set up where the survivors and the homeless can find shelter and care. Special trains are put into operation to evacuate the unemployed and also children to the countryside. With a total amount of debris being six million cubic metres (20 cubic metres per inhabitant), Magdeburg ranks third in the list of most severely damaged cities in Germany right after Dresden and Cologne. On the eve of the war, Magdeburg had a population of 330,000 whereas in April 1945 only 90,000 survivors could be accounted for. 3000 prisoners of the ancillary concentration camp of the Polte ordnance factory are temporarily imprisoned at the stadium “Neue Welt” when Magdeburg becomes the target of an artillery attack. Two grenades explode in the overcrowded stadium. The panic-stricken prisoners attempt to flee and they are stopped in their tracks when SS men start firing their machine guns. On 18th April American troops start to occupy the western part of Magdeburg (until 1st July 1945). Soviet troops take over the eastern parts of the city on 1st May. The American occupation forces appoint Social Democrat Otto Baer as Mayor. 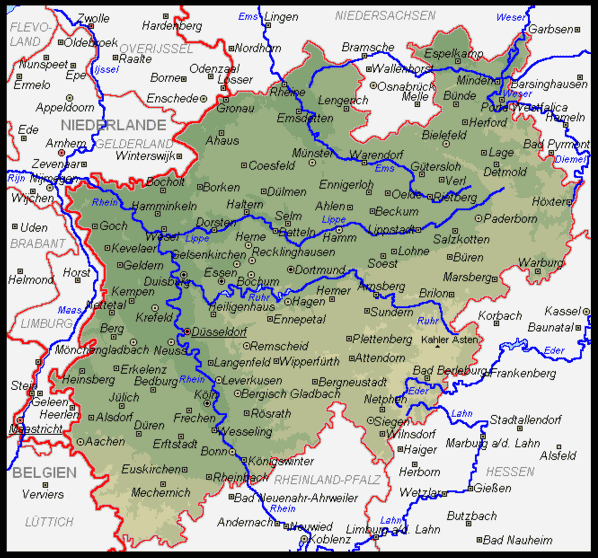 The administrative committee of the province of Saxony constitutes as a self-governing body. On 1st October, 35 schools and about 25,000 students restart their lessons in Magdeburg. In the Monastery of Our Lady the first course for newly appointed teachers is held. performed by Belgians, Dutch, Italians and Poles. 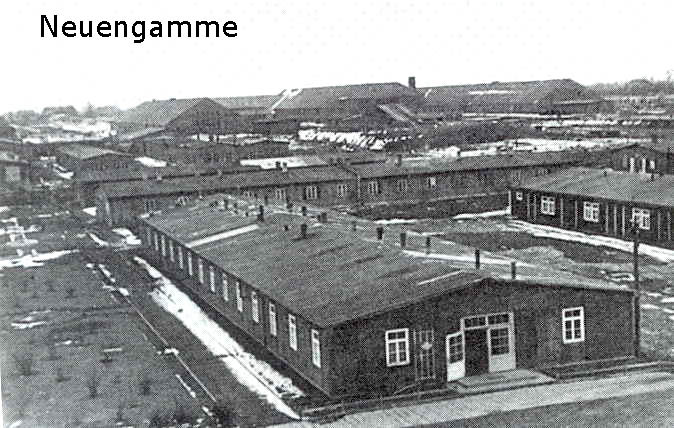 The largest of the camps on Ingelheimer Aue was the concrete plate factory. This is the one from the photo. It is listed on google as Mainz-Ginsheim-Gustavsburg. which registered over 30 births, which means almost 20% of the females ended up pregnant there. forced labor in Germanyt was preferable to the poverty of the homeland (not the communist factor at all). "The first prisoners at Majdanek were Russian Prisoners of War, who were transferred from a barbed wire enclosure at Chelm. According to a book, Majdanek, by Jozef Marszalek, the prisoners at Majdanek were from 28 countries: Albania, Austria, Belgium, Bulgaria, China, Czechoslovakia, Denmark, Estonia, Finland, France, Germany, Great Britain, Greece, Holland, Hungary, Italy, Latvia, Lithuania, Norway, Poland, Romania, Spain, Sweden, Turkey, the USSR, the United States of America, and Yugoslavia. He wrote that Polish citizens were 59.8% of the total, followed by citizens of the USSR at 19.8%, Czechoslovakia at 13.3%, the German Reich at 4% and France at 1.7%. All the other countries put together accounted for 1% of the total. There was a total of 54 ethnic groups represented, including 25 different ethnic groups from the Soviet Union and 4 ethnic groups from Yugoslavia. According to this book, the actual names of only 47,890 prisoners are known, including 7,441 women." The main concentration camp Mauthausen was situated on the border of the two villages Mauthausen and Marbach, in the vicitnity of the quarry Wiener Graben. Prisoners arriving with Kugel (bullet) marked on their transfer papers were executed soon after arrival, without entering their names in prison records, thus an estimated 25,000 persons do not appear on the death records and their numbers were re-assigned to new prisoners. Prisoners worked in the armament industry. Mauthausen provided manpower to Wien, Niederdonau, Oberdonau, Steiermark, Kaernten of the Ostmark and Passau from Bavaria. Mauthausen, a camp for men, opened in August 1938 near Linz. Mauthausen was established to exploit nearby stone quarries; it was classified by the SS as a camp of utmost severity. The prisoners included Italian, French, Yugoslavian, and Spanish political prisoners; Jews from Czechoslovakia and the Netherlands (1941); Gypsies from Austria (1938-40); nearly 30,000 Polish prisoners; and thousands of Soviet prisoners of war. The total number of prisoners who passed through Mauthausen is about 200,000, of whom 119,000 perished. Mauthausen was liberated by the U.S. Army on May 5, 1945. Declassified: NND 92117	File # 802/000530	File name: Mauthausen Concentration Camp Oct 51 - Dec 51 Vol. I am trying to trace the DP camp which my father - Jerzy Aleksander Maresch (dob 23/7/1923) was sent to after the his liberation form Mautahusen concentration camp. He was re-united with my grandfather who was stationed at Meppen DP. Located between Göttingen and Hanover, Moringen was the first central concentration camp for women from October 1933 to March 1938. It became a concentration camp for juveniles from August 1940 to April 6, 1945, holding nearly 1,600 male juvenile prisoners aged 12-22 and sometimes younger. These children were arrested for: refusal to serve in the Hitler Youth; sabotage or refusal to work; criminality; membership in the Swing youth movement; homosexuality or prostitution; and political resistance (especially young partisans from the Slovenian-Austrian border region). The largest German World War II prisoner of war camp was Stalag VII-A at Moosburg, Germany. Over 130,000 Allied soldiers were imprisoned there. It was liberated by the U.S. 14th Armored Division following a short battle with SS soldiers of the 17th SS Panzer Grenadier Division on 29 April 1945. Stalag III-C is notable for the escape of US paratrooper Joseph Beyrle, who subsequently joined a Soviet tank battalion commanded by Aleksandra Samusenko, which returned to liberate the camp. 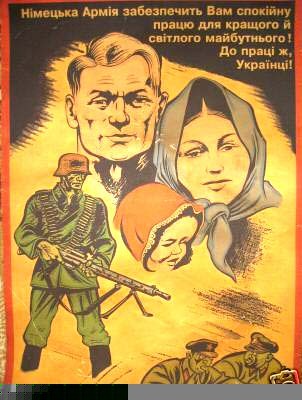 Nazi recruiting poster Nazi poster recruiting Ukrainians to come work in Germany. It promises them peace and good working conditions. A KZ lager / concentration camp near Hamburg, Germany, opened in December 1938, initially as a satellite of Sachsenhausen concentration camp. Neuengamme became an independent camp in June 1940. British troops liberated Neuengamme on May 4, 1945. One day in a British screening centre, the camp administration announced the dismissal of everyone owning an heavy goods driving licence, and were from the Hamburg area. They were needed to clear away debris, etc. Accordingly, our comrade reported himself for the task and was summoned to the camp management. Jews wearing the British uniform sat waiting for him in the office. He was asked for his Service and Identification book (Soldbuch). An officer spoke good German, and leafed through a thick book. Suddenly this Officer pulled a whistle out of his pocket and blew in it loudly. Two soldiers with machineguns (Sten’s) at the ready stormed into the room. Then everything happened very quickly. Hands up! He was taken to be jailed in the nearby village fire station. There he was met by another two British Army Officers, and a physician. Our comrade, a corporal, wearing the tropical uniform, already a prisoner seem to make them curious. When the door closed and they were alone, one of the Officers took our friend aside and wanted to know why and how he, a corporal was arrested. After explaining ‘Bergmann’ etc. This Officer gave our man a tip; to immediately destroy his service book and say at the next interrogation that he was found without identification papers in the camp, and this was the reason for his imprisonment. After three hours passed, a German Paymaster, two SS Officers, and a Captain, were locked up with him. The men were told to sit in the back of a Land Rover, and were driven away. Where? They couldn’t tell? A tarpaulin cover blocked their sight, and three British Soldiers pointing their Sten’s, accompanied them. In the midst of an open road the vehicle stopped. Then they were commanded to surrender all their valuables and money they had on them. One of the SS Officer’s resisted the order with a determined No! He was told to dismount. And all feared for the worst. This Officer was relived of all his valuables with force. The journey continued, and through a gab in the tarpaulin they could see they were in city of Hamburg, but damn it, the vehicle didn’t stop. It drove on. They wondered where they were going? Where they being taken to the Russians? What a frightening thought. Conversation was strictly forbidden, and a depressing atmosphere arose. An hour's drive later they stopped. Shrill commands of unintelligible speech, and a spotlight glared on the vehicle as they dismounted. All around them they saw Barbed wire. Rifle butts rammed their backs, driving them on like cattle, then singled out for interrogation. ing could be seen. Only a bright spotlight, and the questions came in broken German. Where? Which unit? In which countries did you serve? Suddenly a sharp pain was felt in our comrades back, and again the same questions were repeated. His answer was always the same, “I was found in the prison camp with no identification papers. My last unit was Kraftfahrabteilung 10 Hamburg.” (Transport Company 10, Hamburg.) Then more blows. Then a roar, "You SS pig! You’ll hang!" Afterwards, solitary confinement. A dark room with a concrete floor, and wearing only light tropical uniform. Every hour or so, he was dragged back out in the spotlight. The same questions, with the same answers. Again and again, solitary confinement, and darkness. Approximately 3-4 days the same torture continued, and nothing to eat. Although the torturers did not believe our comrade, finally they gave up and went away. He was taken into the POW community. Thousands of soldiers and civilians in huge wooden huts with concrete floors. Now they could talk, but only softly so no supervisor could hear them. He found out that he was now in the former Neuengamme concentration camp, close to Hamburg. Every day there was food. A few pieces of turnip swimming in hot water, served in mess tins. with a fist sized piece of bread, half of it mouldy. At morning roll call, which always lasted about three hours until they were all accounted for, they were told that mould was healthy for them. Those who collapsed from weakness, or showed signs of a cold, were placed between two narrow electrified barbed wire fences. Those who fell, died. In the evenings they were locked up in the barracks by 6 pm. Large bins were placed around the rooms where they had to do their necessities. It didn’t take long for them to fill and spill over. Then they had to lie in the faeces, all through the night. A savage stench of sewer soon filled the rooms. Again and again, they were taken for interrogation. And, again and again, they were returned to the stinking mass piles. During the day they were allowed only to walk in the yard surrounded by barb wire, though only in silence,. Those who cracked up, ran against the wire and were immediately fried. Prisoners were constantly shoving barrows, wheeling away the corpses. Our comrades neighbour, a young raw recruit from Munich had only seen four weeks of service, 190 cm tall, caught tuberculosis in his lung and died. Cripples with one arm, or one leg, the elderly, soldiers of every genre, they was all there, packed together. Our comrade was subdued to this drama for about four and a half months, then it was all over. Finally he found his freedom. But there is always the fear of re-incarceration, and with this comes a great silence. Movie: Reburial of slave laborers killed by German SS (Schutzstaffel) troops in Neuenburg, Germany towards the end of World War II. A procession of men and women carrying dead bodies of slave laborers in open coffins marches on a street. The dead bodies are removed from the coffins by civilians at the burial site under supervision of US soldiers. A subcamp of Ravensbrück concentration camp that existed from September 1944 to May 1945, where prisoners were forced to work at the local airfield, in a Dornier airplane parts factory and preparing anti-tank ditches. The prisoners included Jewish, Gr eek, German, Hungarian, Polish female political prisoners, Russian, and Ukrainian political prisoners. The capital city is Düsseldorf. The largest city is Cologne. Other major cities are Essen, Dortmund, Duisburg, Oberhausen, Aachen, Bielefeld, Bonn, Bochum, Münster, Paderborn, Gelsenkirchen and Wuppertal. Click map to enlarge, download to your desktop and print. If this site was helpful to you, please consider making a donation to keep it going.